You’ve got an event coming up. People are interested in what you do, but how do you actually get them to book into this upcoming event? This post will focus on the structure of the campaign, and in other posts we will look at email copy that compels prospects to take action. 1) The Invitation Flow – this sends a series of emails to your prospects and after every email checks to see if your prospect has booked for the event. If the prospect has booked, the prospect is removed from the flow, and then enters the Confirmation Flow. 2) The Confirmation Flow – this is a series of reminder emails sent to your prospect to ensure that your prospect attends the event that has already been booked. Let’s go through each one of these flows in turn. The decision is checking to see if the contact has the tag ‘2015-july-rsvp-yes’ which is a tag put onto the contact by the Confirmation Flow. 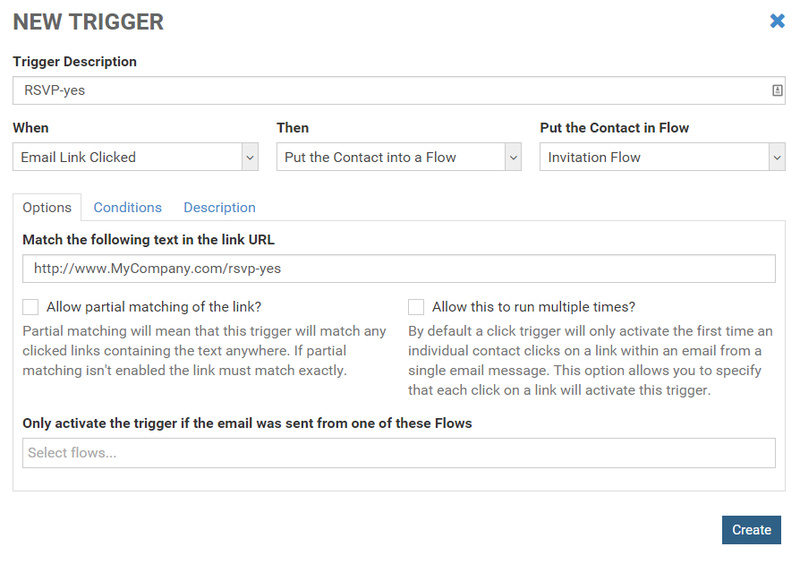 The Confirmation Flow is triggered by clicking a link in an email in the Invitation Flow. This will be explained in detail when we discuss the Confirmation Flow. So, if after 7 days the prospect has clicked the link, the prospect received the tag ‘2015-july-rsvp-yes’ (via the Confirmation Flow) and so the prospect satisfied the condition in the decision and therefore goes down the True path. 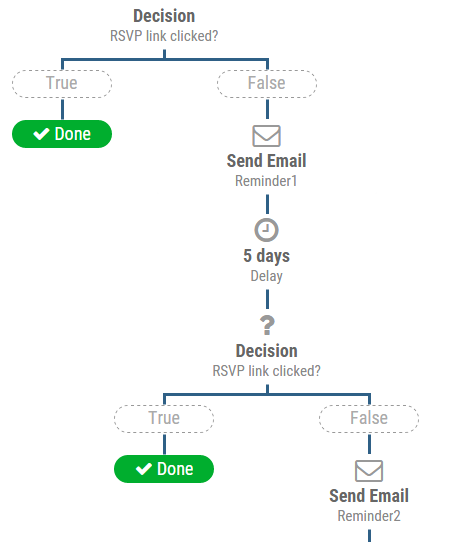 As a result, the prospect will not receive any further emails in the Invitation Flow. However if the prospect does NOT click the link within 7 days, the prospect will not receive the tag ‘2015-july-rsvp-yes’ so the prospect does not satisfy the condition in the decision. Therefore, the prospect goes down the False path. On the False path, the prospect receives Reminder1 email, which should give another angle on why to attend the event. It may just re-state what the first Invitation email sent based on the fact that many people will miss an email. We then wait 5 days and have the same decision as just discussed. If the prospect has clicked the link, the prospect is done. But if not, the prospect then gets Reminder2 email. The task is attached to the contact. This means that the task will contain the contact’s information. The work queue selected is Event Bookings. Work Queues are an efficient way to process through tasks. 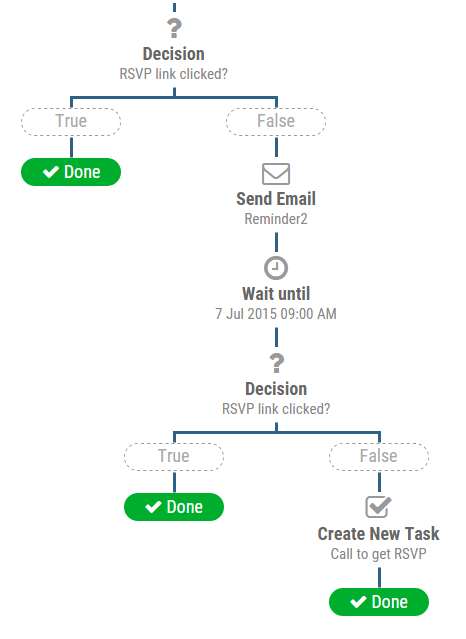 Once you complete a task, you press the ‘Next Task’ button and go straight to the next task. This is much faster than working from a list where you go to one task, complete it, go back to the list, go to the next task to complete it and so on. The due date is 3 days from when the action runs. 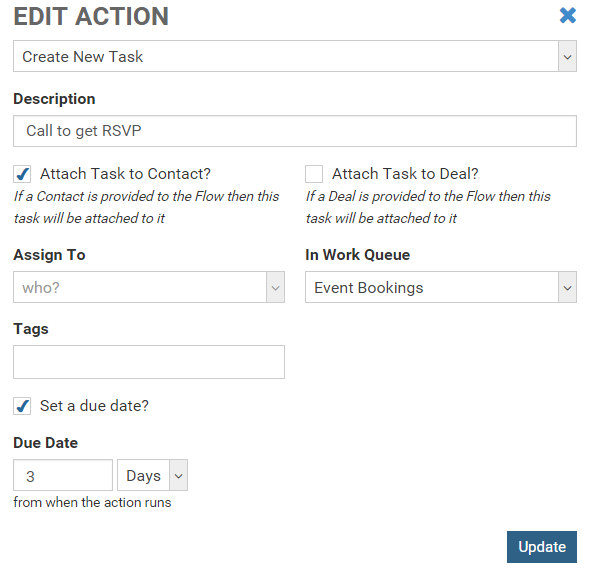 This means that a Manager can go to the Tasks section and immediately see all tasks that are overdue. 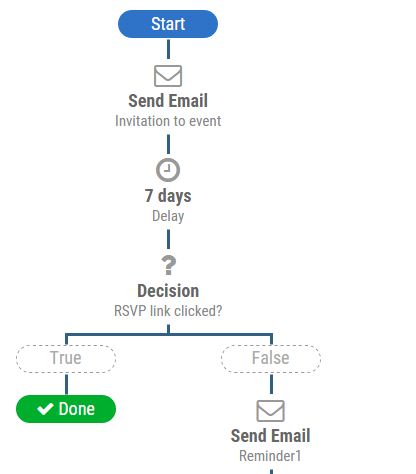 The confirmation flow adds the tag ‘2015-july-rsvp-yes’ so that everyone who clicks the link in an invitation email does not receive an additional invitation. Then the prospect receives a confirmation email immediately, and a final confirmation email 2 days prior to the event. With LeadMachine, it takes just minutes to build these flows, and once built you can visually see exactly how they unfold.